Short Version: A thoroughly enjoyable, light, animated summer family story that doesn't break any new ground, but does provide an amusing hour and a half of harmless diversion. Long(er) Version (spoilers ahead! 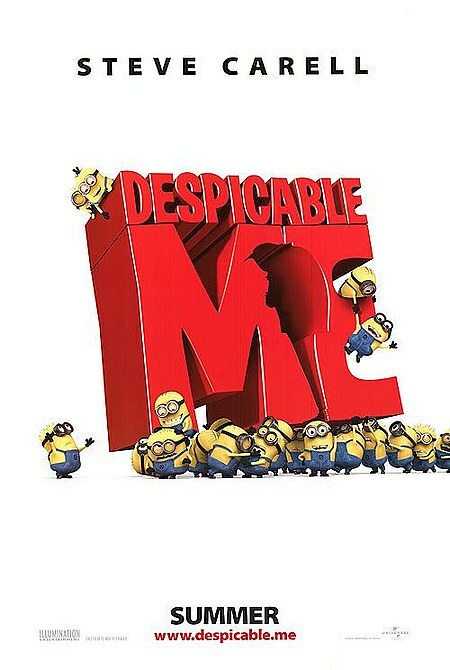 ): "Despicable Me" doesn't do anything terribly new, but what it does, it does reasonably well. The animation is very good, the characters are sufficient to carry the (admittedly rehashed) story, and the production is top-notch. All of which would be a long-winded way of saying "boring, average movie" if it weren't for the presence of the Minions, those goofy little yellow guys with the infectious giggle that provide the movie's best moments. In fact, if we could have an entire movie, or series of animated shorts, just about those little fellows I think we'd have a real winner on our hands. As it is, the human characters are all about what you'd expect, from the three stereotypical orphaned girls (the grown up one, the rebellious grumpy one, and the adorably cute young one) to the Grinch whose heart grows three sizes that night. But it's all couched in fun super-villain tropes that should be comfortable and familiar to all of us geeky types. Some of the throwaway gags in particular are a hoot, like the "piranha shooting gun" that hearkens right back to the good old days of Foxbat in the Champions universe (only not as effective). The story is about what you'd expect, heartwarming and predictable. But Gru, the main character, is well voice-acted by Steve Carell and has a lot of charm thanks to the occasional flashbacks to his childhood. I mean, who among us hasn't stared up at the moon as a young boy and wanted to shrink it down to pocket size? The accent sounded a little like maybe Carell had swallowed Ensign Chekov from the original Star Trek series, but still was engaging. The three girls were, as I said, pretty stereotypical and all too predictable, but they served their functions fine. But bottom line, the Minions are why you should see this movie. They're funny and charming and riveting to both watch and listen to, almost like they're escapees from a Pixar movie. Sadly, they did not bring the Pixar script writers with them, but they're still fun to see. And see it you should, albeit you might want to take it in at the matinee or wait for it to come to the dollar cinema. We saw it in 3D, which was cool, but it's not really a "must" 3D movie -- 2D would be just fine, I'd think. Definite thumbs-up from me and my wife, worth the time (particularly on a hot day when the theater will be nice and air conditioned!). I liked it too, and I’m a grandmother! I loved that he lived in the suburbs. When he drives that huge car, I had to think the Pixar folks had their tongues in cheek for the giant Hummers in the grocery store parking lot. Yep, a good way to spend a hot or rainy afternoon. I saw it two days ago, and I gotta say, I really enjoyed it. It’s some goofy fun, and while it’s predictable, it’s still really good and a lot of fun. Was there any difficulty with all the iPhone-armed kids getting instant translations of the minions’ dialogue? Apparently, it was some kind of app that gave viewers a real-time translation of the minions that could be downloaded and run during the movie. Went with a group of friends and took the kids. I think this review is exact. It wasn’t that surprising, or new. My 11 yo said she loved it. My 3 yo sat still through the entire thing and seemed to enjoy it. For the first half I was kind thinking it wasn’t anything that incredible, but started laughing with the kids during the last half. It was feel good family movie. We had a few iphones, but I guess no one knew about the ap, sorry KM, can’t help ya there. As Jeff mentioned above, “A harmless diversion”. Me and the family enjoyed it so it wasn’t a waste of money.